In 1999, Gerd Meuer, for decades one of Germany's leading Africa journalists, donated his substantial collection of manuscripts, audiotapes, photos and other valuable documents to the Jahn Library for African Literatures. Gerd Meuer has been involved in many African-literature events and broadcasts in Germany, but also in other countries, as co-initiator and co-organiser, presenter and translator. Gerd Meuer mit einem Dichter aus Soweto während der Buchmesse in Frankfurt, 1980. © Gerd Meuer. In the context of events on African literature and music, politics and the environment he has worked with many radio stations and TV channels, including ARD, DW, SRG, ORG, Radio France, BBC, Radio Nederland, several African broadcasting corporations, Radio Pacifica, National Public Radio (USA), and other public as well as private institutions. His articles have appeared in many journals and newspapers. In the course of his career, he has developed friendships with many African writers, most prominently Nobel Laureate in Literature Wole Soyinka. 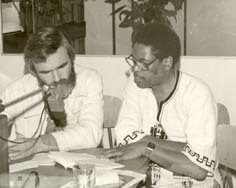 As a teaching and research facility, the Gerd Meuer Archive is of interest mainly to students and scholars in the field of African literature and music. It comprises interviews with African writers and musicians as well as reports on a broad range of topics, both in aural and written form. Apart from the about 200 tapes from the 1970s to the 1990s, some of which have been dubbed to CD, a great number of manuscripts, articles and other textual documents, the numerous photographic documents are also of great interest. 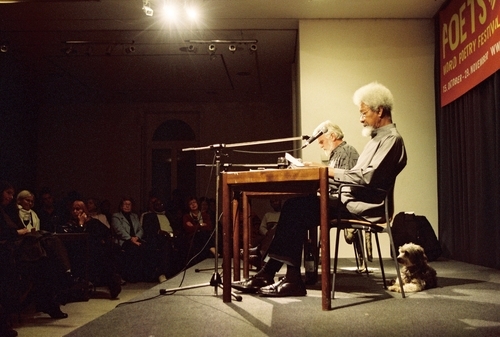 Gerd Meuer presenting a reading with Wole Soyinka at the Deutsch-Amerikanisches Institut Heidelberg, 2004. The dog, who is listening so attentively, is called Lola. Like her successor Cara, she is a great fan of Wole Soyinka. © Gerd Meuer.